Successfully Added Conquest S8 Rugged Phone 2017 Edition - Android 6.0, Octa-Core CPU, 4GB RAM, Dual-Band WiFi, 5 Inch FHD Display, 4G (Red) to your Shopping Cart. With the 2017 version of the Conquest S8, you’ll always stay connected no matter where you’re at. 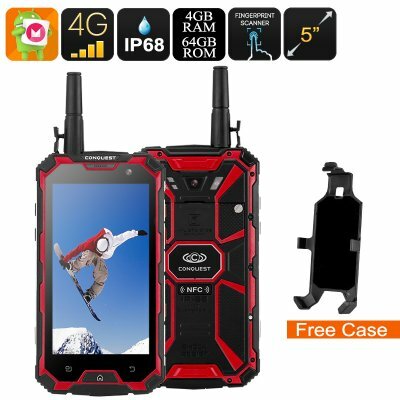 Thanks to its IP68 design, this Android phone is perfect for those of you that work in rough environments. Like a true rugged phone, this Android device is resistant against water, drops, and dust. It furthermore has been equipped with Corning Gorilla Glass 4. This ultra-strong screen makes sure your display won’t scratch or break when you accidentally bump into something. No matter what you throw at this Android phone, it is virtually indestructible. The Conquest S8 rugged phone comes with an SOS feature and walkie talkie support. Thanks to this, the Android phone is the perfect companion for all outdoor enthusiasts. It furthermore packs a whopping 6000mAh battery that provides enough juice to get you through multiple days of smartphone usage. The next time you head out into the wild you can leave with confidence. With this Android phone at your side, you won’t run out of power anytime soon. Packed within its IP68 body, you’ll find a powerful Octa-Core processor that has been clocked at 1.8GHz. Additionally, it comes with 4GB of RAM and 64GB internal storage. With this sophisticated hardware at hand, you’ll be able to enjoy the latest Apps without dropping a frame. Whether you’re into games, movies, or browsing the web – nothing is too much for this rugged phone. On its 5-Inch IPS display, you’ll be able to enjoy all your media in crisp 1080p resolution. No matter where you’re at, from now on you’ll always be able to enjoy a stunning visual experience. By supporting 4G connectivity and Dual-Band WiFi, you’ll always be able to browse the web at lightning speeds. Whether you’re at home, in the office, or out in the wild – from now on you’ll always be connected. To take the absolute most out of your upcoming adventures, this rugged phone packs a mesmerizing 16MP camera. This amazing piece of equipment allows you to shoot stunning photographs and Full-HD video of all those special upcoming moments in life. From now on, you’ll be able to recall memories with friends and family and make sure not a single moment ever gets forgotten again. The Conquest S8 comes with a 12 months warranty, brought to you by the leader in electronic devices as well as wholesale electronic gadgets..